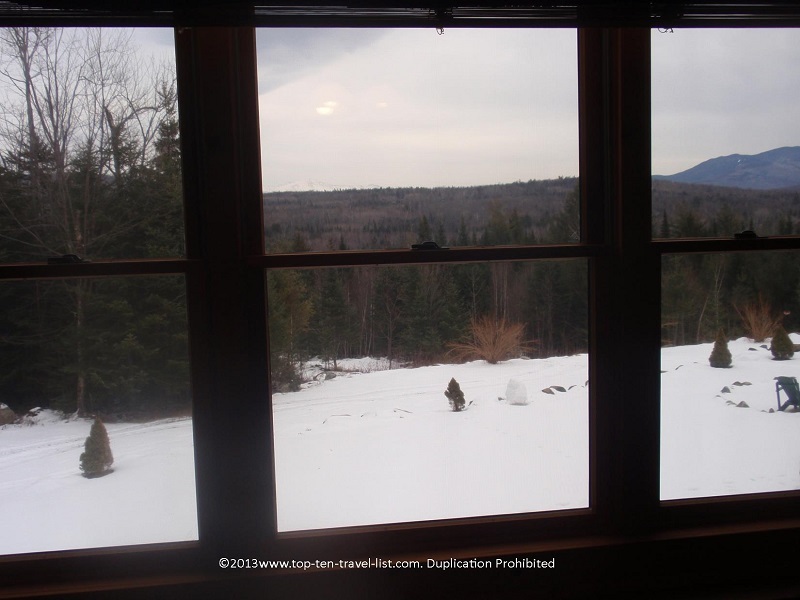 A Fantastic, Snowy Winter Getaway in the White Mountains of New Hampshire - Top Ten Travel Blog | Our experiences traveling throughout the US. 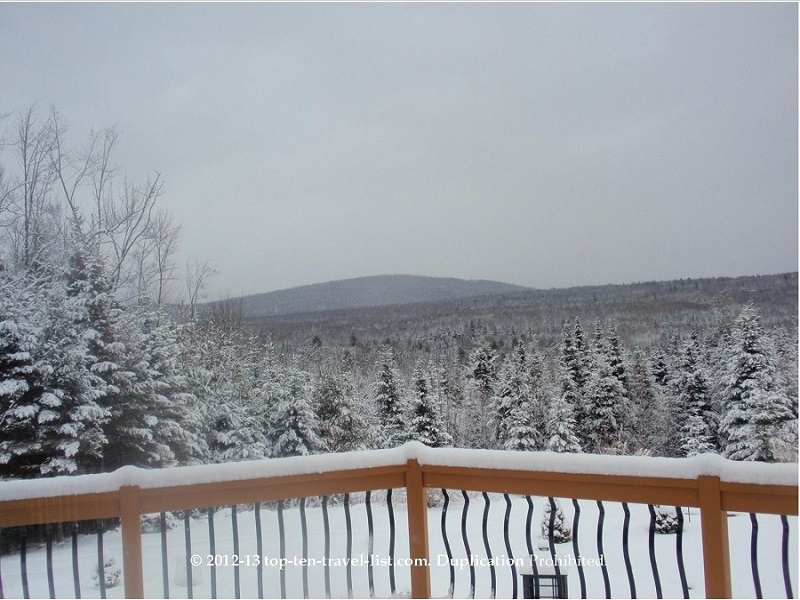 The White Mountains of New Hampshire are breathtakingly beautiful during any season, especially the snowy winter months. The opportunities to engage in fun winter activities like sledding, snowshoeing, and skiing are endless. Due to the close proximity to cities like Portland, Boston and Providence, the White Mountain region is an easy, relaxing weekend getaway option anytime of the year. 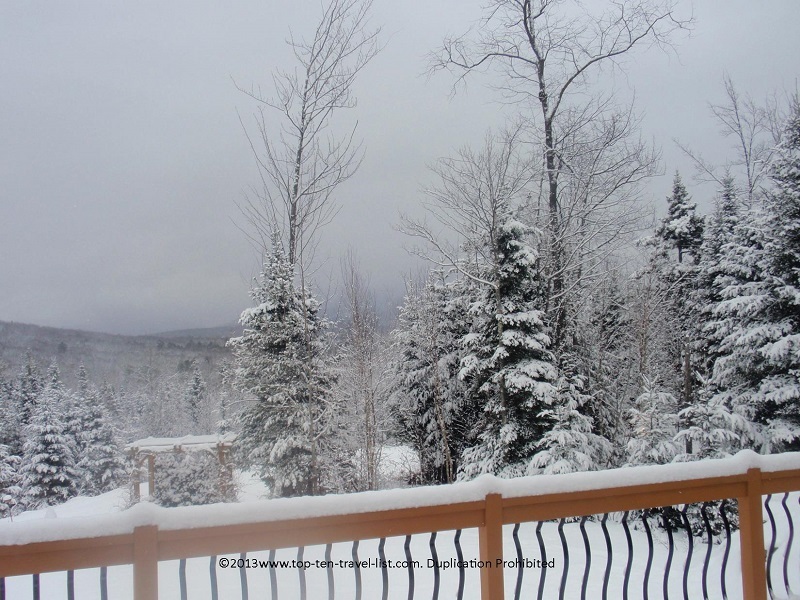 Even if it is a slow season (snow-wise) in your city, you can enjoy your winter fun here in the White Mountains. We did a little research online for the top rated New England inns and found out about the Bear Mountain Lodge, a highly regarded bed and breakfast in Bethlehem that has won numerous awards over the years. Frommer’s rated Bear Mountain Lodge as one of the top 10 romantic inns of New England. In addition, BedandBreakfast.com has rated the inn as one of the Top 10 B&B in New England for both 2009-2010 and 2010-2011. Bear Mountain Lodge is located in Bethlehem, a small village in the White Mountains that is surrounded by beautiful forests. Because of its’ proximity to major cities (80 miles from Portland, Maine and 138 miles from Boston) and potential for winter snow (18 inches of average from December-February), it is the perfect winter weekend getaway. We were both very pleased with the location, amenities, and beautiful rustic decor of the cabin. Bear Mountain Lodge is located on 26 miles of private, secluded property. It’s nestled away from the main highway, providing a quiet, relaxing setting. This secluded location leads to some absolutely breathtaking views and a true “out in the wilderness” feeling. The great room features floor to ceiling windows with panoramic views of the surrounding mountains and forests. I could sit there all day! 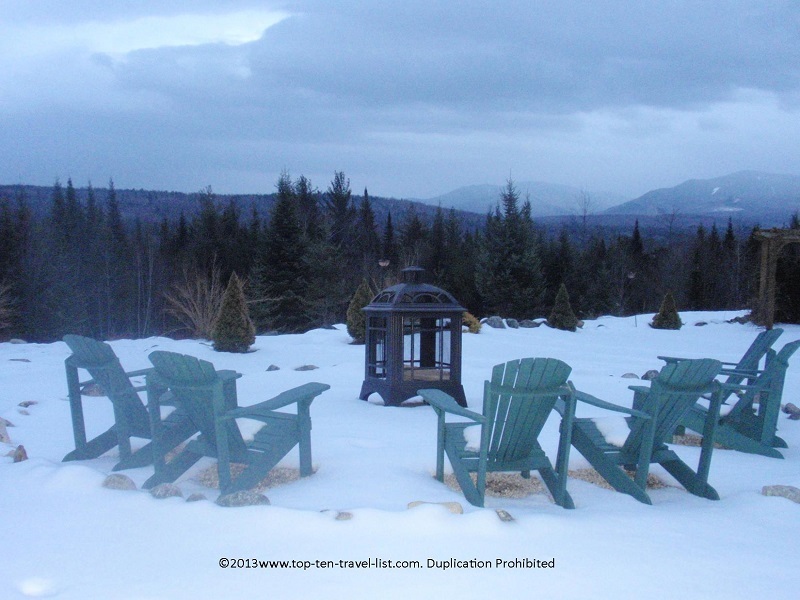 We had a fun time playing Checkers and Scrabble, all while taking in the amazing winter views. A beautiful wrap around deck located right off from the great room is perfect for enjoying the beautiful summer and spring seasons. It would be an ideal spot for reading or enjoying a coffee during the warmer months. 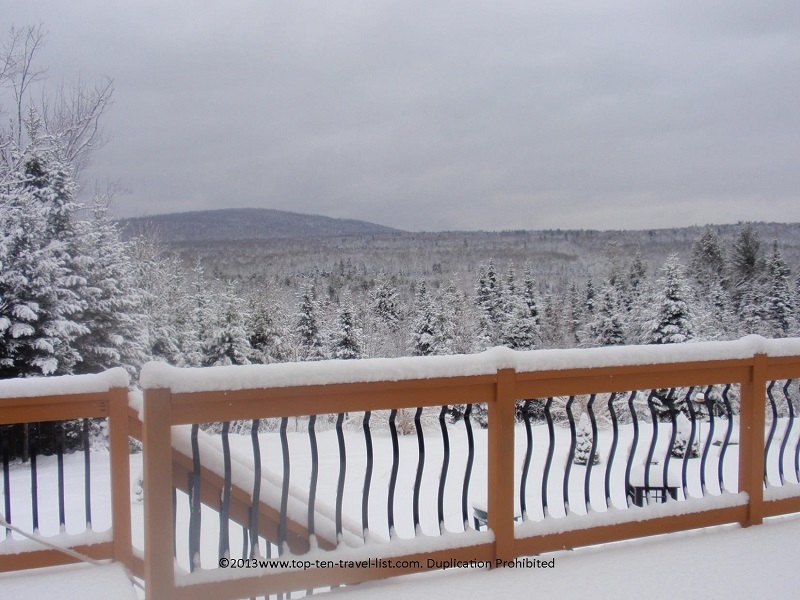 Check out these beautiful snowy mountain views from the balcony! 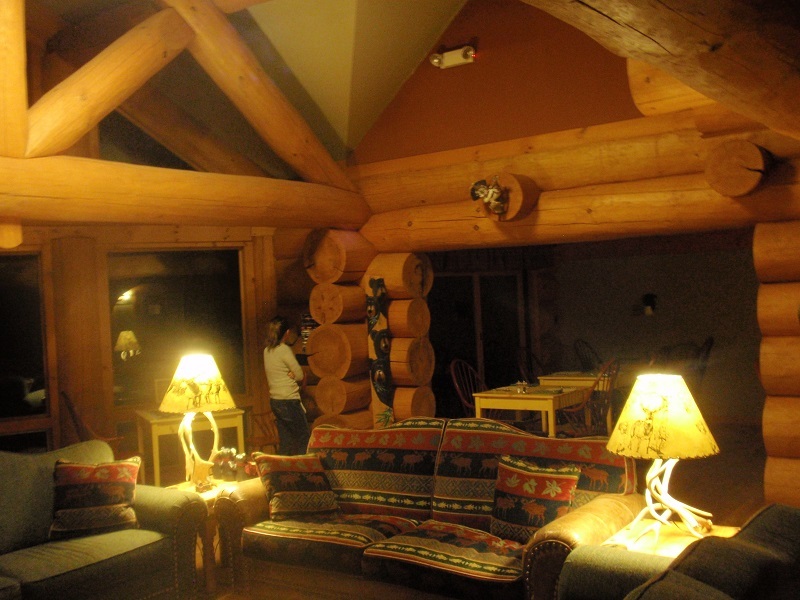 The lodge is festively decorated in a woodsy rustic theme. Everywhere you look, you will see amazing lodge style architecture charming rustic touches. 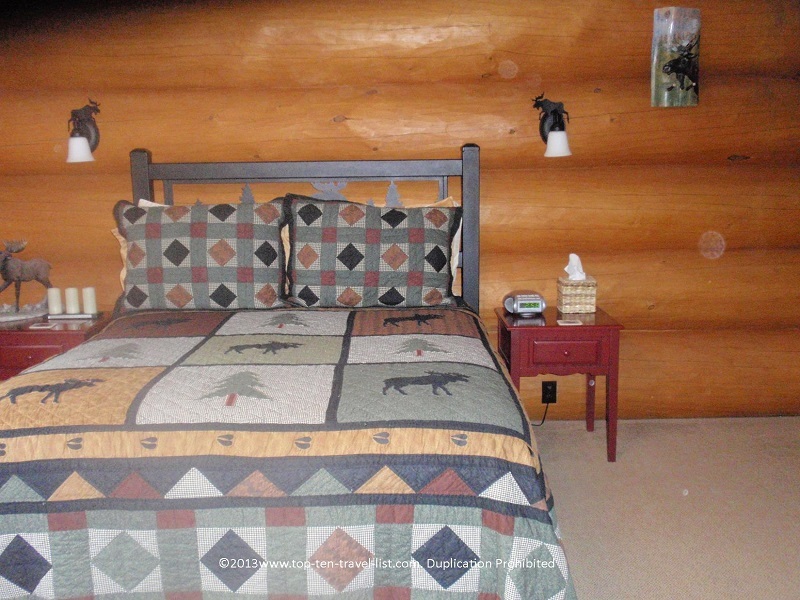 The consistency of decor throughout the cabin is a major plus. I love the cozy atmosphere of the lobby – a wood stove, comfortable couches for relaxing, relaxing music, and magnificent views. 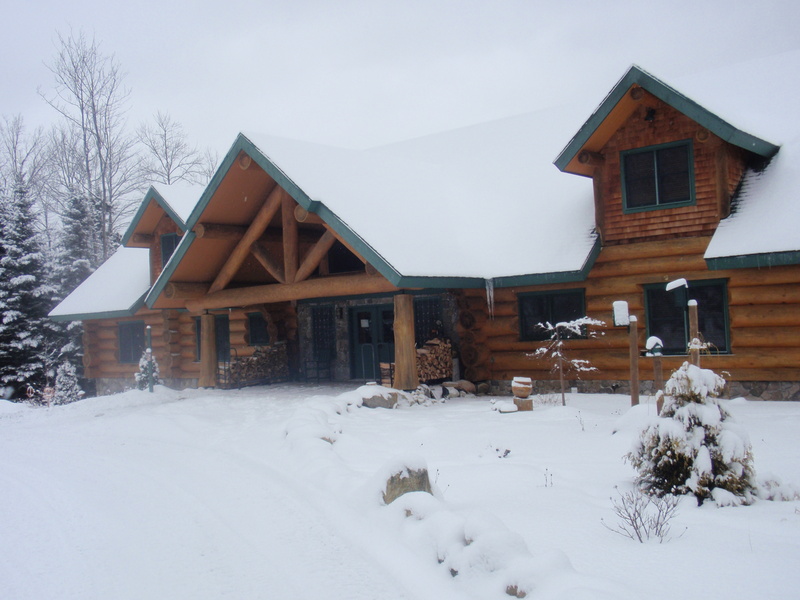 Nothing says a winter getaway like a stay at beautiful Bear Mountain Lodge. Our room was decorated beautifully in an attractive moose theme. It was a bit small, however, we had nice views of the surrounding mountains. A great view of the mountains from our bedroom. What a nice view to wake up to! He The first floor features 4 basic rooms which come with all your standard amenities. The rooms on the second floor cost a bit more but offer advanced amenities such as a steam shower, fireplace and/or jacuzzi. The inn is a bit pricey, but well worth the cost just for the views alone. The innkeepers (Mike and Carol) are friendly and willing to assist you with area recommendations for dinner or activities. 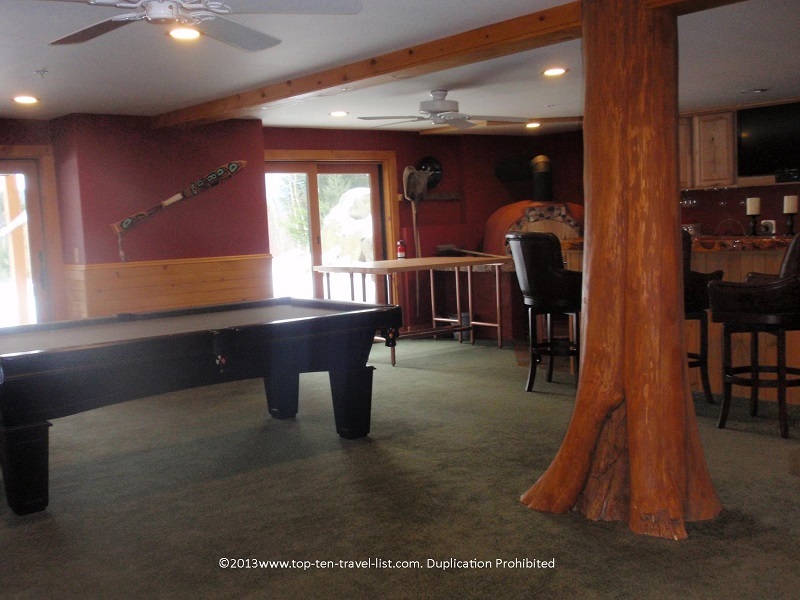 There are plenty of amenities at the lodge itself including a pool table, year round hot tub, and 24 hour drinks including hot coffee and tea (Keurig machine), beer, and wine. If your brave enough to bear the cold, you can enjoy a relaxing soak in the outdoor hot tub as you watch the snow fall down. What a perfect romantic setting! 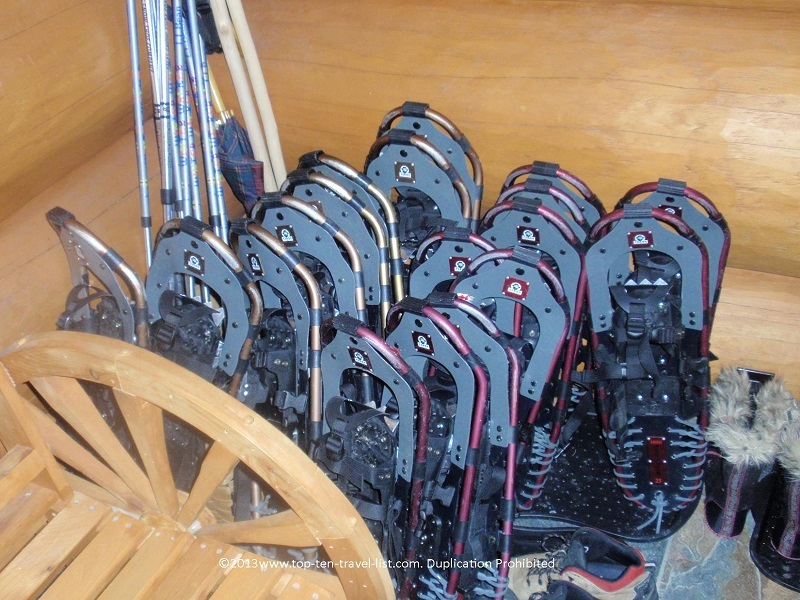 Be sure to take advantage of the onsite snowshoe trails and complimentary snowshoes. We have always wanted to go snowshoeing, but somehow never got around to it. Having access to on site trails without driving through the snow was very convenient. I’d rather spend my time enjoying myself outside then driving around through the snow to the activities. We had an absolute blast! If you have never tried snowshoeing, you must check it out while the equipment is easily available. The next morning there was an additional 4 inches of snow on the ground, which made our adventure even more exciting and challenging! 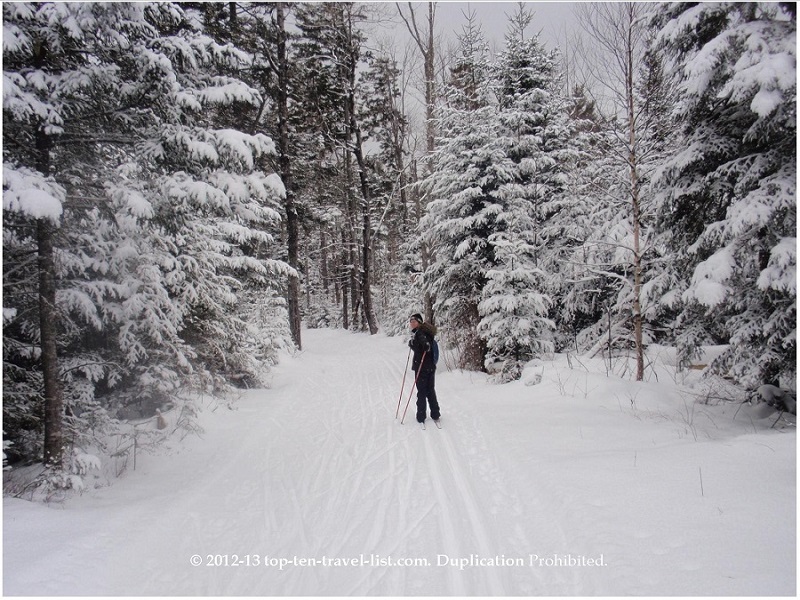 Check out this idyllic setting for snowshoeing (or any other winter activities). 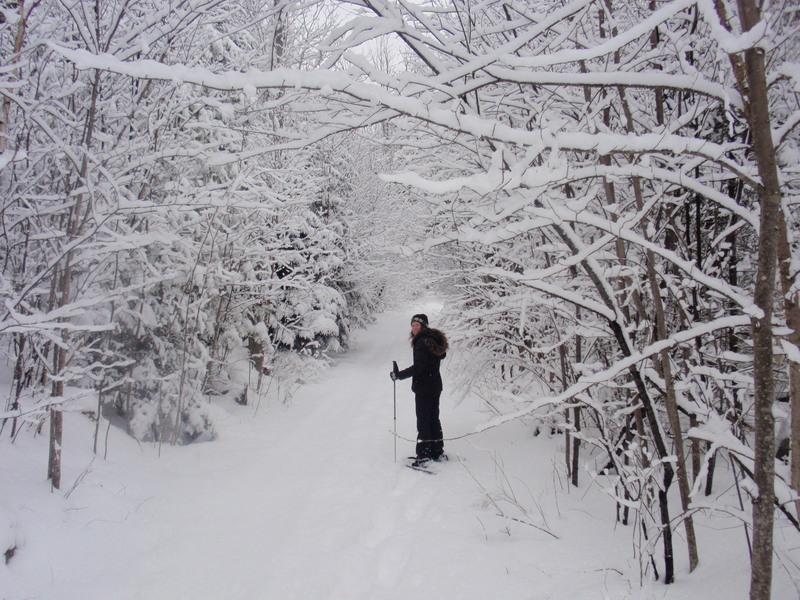 In addition to on-site trails, you can snowshoe the various trails found within the national parks. A plate of afternoon brownies with a cup of hot cocoa or tea is the perfect treat waiting for you after a morning of snowshoeing. The cute little mountain themed breakfast/relaxing area offers the perfect wintry setting. What a treat after being out in the cold snow! The breakfast in the morning was the only let down of our stay. To be honest, I expected it to be much better. Breakfast consisted of a tiny fruit cup followed by stuffed crepes with blueberry sauce and a side of sausage. Talk to the innkeepers in advance if you have specific allergies or food requests. We made the mistake of forgetting to inform them of our specific requests, and thus, were left than a less than filling start to the day. The crepes were delicious although I would have preferred eggs, toast or even potatoes in place of the sausage. The inn is immaculately clean (all guests must take their shoes off at the door). The innkeepers are always around to answer questions and engage in friendly chit chat (they were there to greet us when we arrived and offered to help us carry our luggage). Be aware that this bed and breakfast is aimed a bit towards an older population. 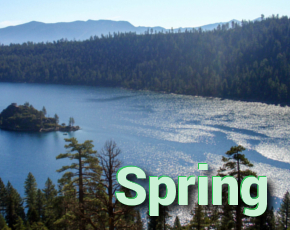 If you are looking for a quiet weekend getaway, then Bear Mountain would be your ideal escape. It’s definitely not a kid friendly inn, and is more suited for couples and older adults. Quiet hours for the pool table/bar room end at around 9:30pm and the lights in the main room are shut off around 10:00pm (this is perfect for those looking for a laid back quiet time). 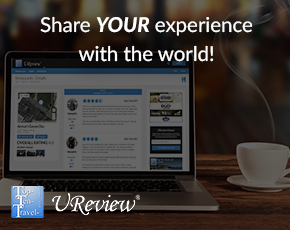 If you are looking for a more upbeat party atmosphere, you should look elsewhere. If you are looking for a quiet rustic themed lodge with great views, great amenities, and access to winter activities then you are in for a real treat. Special package deals are available. Please check the website for additional details. In addition, you can sign up for special winter activities such as s guided night snowshoe hike with innkeeper Michael. The Colonial Theater, a historic Main Street theater built in 1915, features both live shows and movies. Cold Mountain Cafe is a charming little cafe with a great menu and great location in downtown Bethlehem. Downtown Littleton is another quaint downtown with plenty of unique shops and restaurants to visit. Bretton Woods Nordic Center at Mount Washington Resort is one of the best places in the country to cross country ski, especially if you are a beginner. The pristine setting through the forests and streams of the White Mountain National Forest can’t be topped. Cannon Mountain is the area’s premier resort for alpine skiing, featuring the largest vertical drop in New Hampshire. The recreation park is Bethlehem is home to a free, lighted outdoor ice skating rink. Take the scenic journey along the Mount Washington Cog Railway. The 3 hour ride travels to Mt. Washington, the highest peak in the Northeast. Reserve your spot for a guided snowmobile tour at Northern Extremes in Bretton Woods. Enjoy a sleigh ride at The Fraconia Inn.